Discover unique and fun clothing designs, and get them custom made to your size and choice of fabrics. 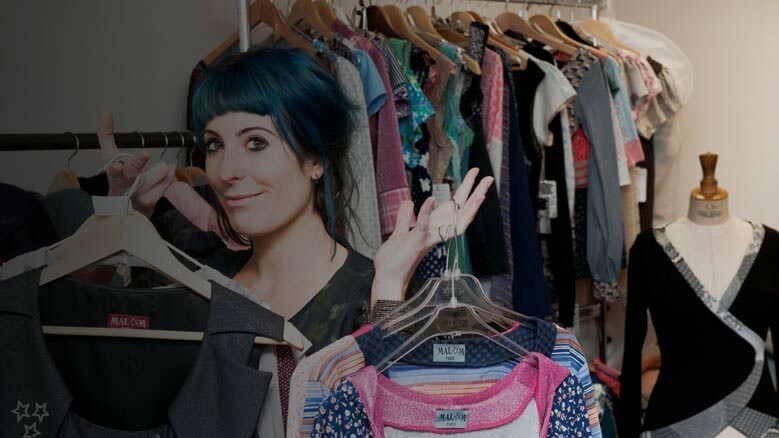 Browse a selection of unique, fun womens clothing and accessories by French designer Malam. Colorful newsboy cap, handmade from a crazy patchwork of vintage cotton fabrics in beige, orange, pink tones. Features an assorted fabric flower in the front. Fully lined. The shape of the visor can be altered thanks to a metallic insert. One of a kind. Long-sleeved top, handmade from supple black jersey with a grey, purple, pink paisley pattern. One sleeve is cut from a patchwork of assorted jersey, mesh and lace fabrics. Handmade, sleeveless summer top in vintage checkered jersey and coral red lace, with a V-shaped neckline. One of a kind. Short sleeveless dress, handmade from a vintage crimson red and orange floral cotton with a very wide print. Supple pleated hat, handmade from crumpled khaki green wool blend. Fully lined. Limited edition. Women's sweater, handmade from two vintage striped jersey knits in white and red. Limited edition. 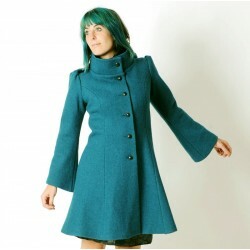 Handmade teal blue women's winter coat with tall collar and goblin hood, from teal blue wool (100% virgin wool). Long flared princess sleeves. Limited edition. 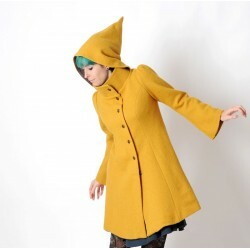 Handmade women's winter coat with tall collar and goblin hood, from mustard yellow wool (100% virgin wool). Long flared princess sleeves. Limited edition. Handmade stylish armwarmers or fingerless gloves, from brown jersey and mesh stretchy fabric with fake holes. Professional finishes throughout. One size. Limited edition. Handmade long stretchy cuffs in thin black jersey with a floral pattern, hemmed with a black pleather ruffle. One size. Limited edition. Hooded sweatshirt, in thick black jersey with small white stars, and solid black jersey. Limited edition. Within 1 business day for all items in stock, via Priority, tracked shipping. Credit card, PayPal, checks and bank transfer in Euros. 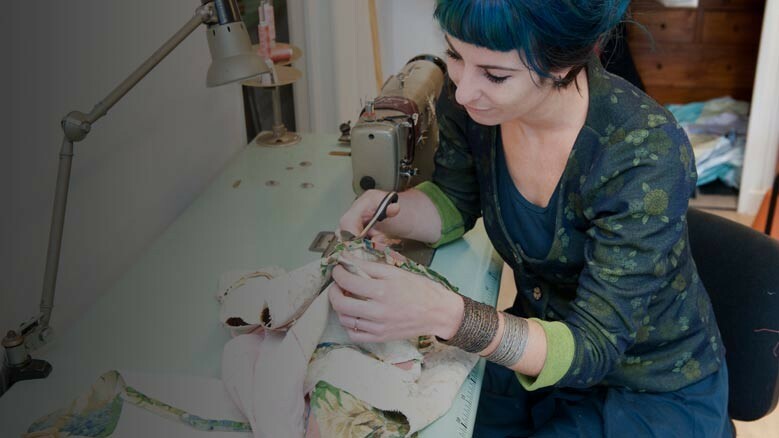 All designer garments are one-of-a-kind or handmade in a limited edition. Most of the clothing and accessories shown can also be custom handmade to your size and choice of fabrics and colors . Handmade dark brown varnished leather tote bag, with inside and outside pockets. Handmade stylish armwarmers or fingerless gloves for womens or mens armwarmers from textured coral red jersey. Professional finishes throughout. One size. Limited edition. Floral newsboy cap, handmade from antique beige and blue floral cotton and perforated beige faux suede. Fully lined in linen. The shape of the visor can be altered thanks to a metallic insert. Limited edition. Floral sleeveless white and navy dress, handmade from dotted jersey, vintage cotton and floral supple fabric in assorted tones. Pointy collar at back and tiny sleeves. One of a kind with these exact fabrics. Handmade Malam Snood / Neckwarmer in a vintage black and beige geometric patterned vintage fabric. Fully lined in black jersey. Limited edition, last one available. One size fits all. Pair of handmade fingerless gauntlets in vintage paisley print white and rusty brown fabric. Underbust bustier with lace-up at back, handmade from dark blue leather, fully lined. Limited edition of 3. Handmade bubble dress with short sleeves and a small collar, in two different dark blue wool fabrics. One of a kind.